Blues, New Orleans, Rock 'n' Roll designed for Swing dancers and those that appreciate Blues history. 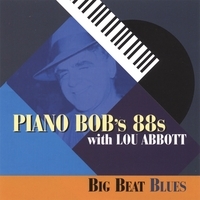 This 12-song CD is the combined effort of Piano Bob and drummer/vocalist Lou Abbott. Piano Bob received the B.B. King Lucille Award from the Blues Foundation at the 1992 W.C. Handy Awards in Memphis, Tennessee. Lou Abbott received his doctorate in Percussion from the University of Miami in 1999. Other contributors: Dave Wilkinson and Matt Bonelli on acoustic bass, Big Al Ferraro and Leo Casino on saxophone, and Bob Loiacano on electric guitar. Big Beat Blues features songs from a time when rock 'n' roll had yet to gain a name. Many terms (some derogatory) were applied to this new music that seemed to contain too much R&B to play on C&W radio and vice versa. Bob and Lou think that is the lure of this music. The ethnic “gumbo” of musical styles from New Orleans, the Country versus Urban Blues sounds of Barrelhouse Piano and Amos Milburn, and the wild Shouter styles that poured out of Kansas City are all included. To add a final touch, two producers mixed Big Beat Blues. Chris Rodriguez (songwriter and producer for Paulina Rubio, Jennifer Lopez, more) did the first mix in a modern, urban style. Rudy Sanchez then tweaked the sounds and altered the length of the songs in order to fit the format most comfortable for dedicated Swing Dancers. The result is an upbeat, well-recorded CD that works for dancing or simply tapping your foot. Great CD! Lots of good dance music. Tracks 1 & 5 are especially upbeat. GREAT CD for swing dancing or beer drinking!. Loved this CD. Great band. Piano playing and vocals were excellent. What a suprise to hear Rock This House at Christabell's Quarter in Coconut Grove last nite, from your Big Beat BLues CD...you had the house a rockin! !